Before I even begin to answer the question, let’s make one thing clear: Transition Lenses are Photochromic Lenses. The answer matters because most of us don’t have the kind of vision insurance to pay for exorbitant glasses. Transition Optical is a brand of Photochromic, transitional sunglass lens. I am unable to do a full review on transition lenses because I haven’t actually tried them. Why? Cost. Transition lenses cost about 6-7 times more than the traditional photochromic offered by the Zenni Optical online eyeglasses retailer. What is different about transition lenses that would make them cost so much more? 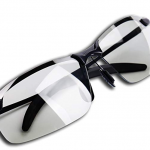 Transition Optical advertises that there photochromic glasses are made from patented dyes. Well, okay – that sounds nice, but what does it do for me or you? From what I could find, Transition Optical neither offers any detailed explanations of the benefits of their patented dyes, nor are there any impressive reviews comparing their advantages over traditional, generic color-changing shades. I did see one advantage – that is, transition lenses come in flatter, thinner glass than the traditional photochromic lens which is offered by Zenni Optical. That’s not enough to make me pay $139 more for them. So, what did I do? Well, my first pair of glasses from Zenni Optical were so cheap, that I decided to buy another pair and give the transitional technology a try. So for the sake of a review, let’s forget about Transition Lenses and talk about how these lenses in general, perform as sunglasses and regular glasses. Your first question might be, “why would I want photochromic lenses on my eyeglasses?”.. Good question. My Lasik Monovision has served me well, but there are times when I like to see better; mainly while driving a car. My prescription, cheap eyeglasses from Zenni Optical are great, except they leave me squinting while driving a car. It would also be nice to have 20/20 vision in both eyes while hiking, bike riding, fishing and viewing nature in the great, sunny, Colorado outdoors . For a measly $19.00 extra, it was time to give photochromic lenses a try. 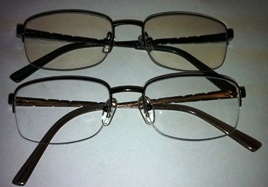 I duplicated my prescription from my last Zenni Optical order and added the transitional feature for just $19.00 more. So, how do they perform? As a pair of indoor glasses, my new glasses work much better than I had imagined. They stay nearly as light as my regular glasses indoors and become sufficiently dark outdoors. The transition from darkness to sunshine is much better than I anticipated. The photochromic lenses reach about 80% of their total darkness in about 2 minutes. In approximately 15 minutes, they are as dark as you’d ever want them to be. The same is true in reverse. I was really worried that the photochromic lenses would not turn light quickly enough when coming in from the outdoors. I was pleasantly surprised. In about 2 minutes the photochromic lenses adjusted to about 80% of their total lightness, making them completely adequate for seeing indoors. Likewise, it takes about 15 full minutes for them to achieve their full lightness indoors. This is completely satisfactory for me. I thought the photochromic technology was the greatest thing since sliced bread until I took them for a drive. I got in the car with my new chameleon sunglasses hoping to experience great driving vision combined with the same protective, brown-tinted shade of my regular sunglasses. As I drove into the bright sunlight, I wondered why it was taking so long for the sunglasses to darken. After 10 minutes, I concluded that my transitional sunglasses were not going to darken as much as I wanted them to. The tinted or UV coated glass of the car was keeping the photochromic technology from doing its intended job. On the other hand, maybe this is exactly what they were supposed to do, since the car glass is already protected. That may be true, but unfortunately, my eyes still felt like squinting and reaching for a pair of regular, dark sunglasses. hmmm…darn – photochromic glasses sounded so good. In conclusion, auto-changing sunglasses lenses work great for every day use in and outside of your home or office. Just don’t expect to get relief from the bright sunlight while using them in your car. Maybe photochromic lenses are something we can learn to love? One of the hottest selling eyeware items this summer happens to be the transition reading glasses by EnzoDate . These are so nerdy that they are stylish. 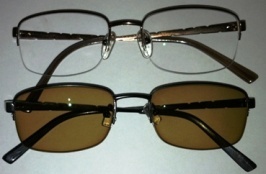 The lenses are the same excellent transition type that you get when you buy those expensive prescription transition glasses. Let’s face it, after age 40, our eyes don’t see the same way as when we were younger. And, don’t we all like to sit outside on a nice sunny day and read? The beauty of transition reading glasses is that they will adjust to every single reading situation we may encounter throughout the day. thanks for the review. i used to have transitions but they were expensive. i just ordered photocromic lenses from zenni and i hope they turn out alright. How about clip on polaroid’s just for driving? That would cut down on the summer sun plus the reflective glare off the road during winter rains. I’m still wondering what the 1.59 and 1.61 means when put next to the photochromatic?